New Appearance: Hugh Jackman walks arm in arm with daughter Ava through LAX! He's the Hollywood A-lister who was spotted getting an early morning workout in at Sydney's Bondi Beach last Thursday. And Hugh Jackman was back at the iconic beach on Saturday, putting in another shirtless, Herculean performance with his personal trainer Michael Ryan. The 49-year-old displayed a formidable level of physicality as he took to the surf with his workout mate. New Appearance: Exclusive Hugh Jackman Captured Swimming At Bondi Beach On July 2017! He's the chiselled Australian actor who has flaunted his rippling form on the big screen as the superhero Wolverine. And Hugh Jackman gave Sydneysiders and up-close-and-personal look at his enviable body when he took an early morning swim at Bondi Beach on Thursday. Arriving at the iconic beach with his personal trainer, Hugh looked ready for a morning workout in a dark blue hooded sweatshirt and a pair of black shorts. Gllery Updates: Exclusive Hugh Jackman Interview For "Logan" At Doubon Platform! Finally I have managed to upload another set of high definition screen captures from Hugh 16 minutes interview with Doubon that uploaded right here on Youtube. Check out the gallery to view for over 600+ high definition screen captures from the interview segment and browse the previews below! 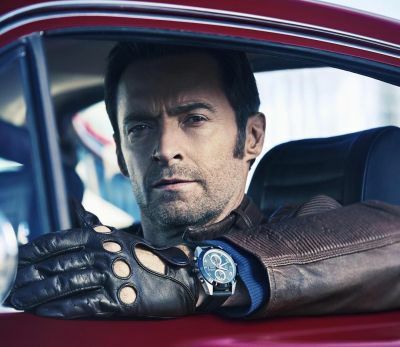 Project Updates: Hugh Jackman Presents The New Montblanc TimeWalker Collection! Paying tribute to Minerva’s extraordinary heritage, Montblanc takes a journey back to the glory days of motor racing with five new TimeWalker timepieces that capture the beauty, spirit and values of motorsport history. The rebirth of these professional watches showcases the performance and innovation of the new Montblanc TimeWalker collection. Project Updates: Exclusive More Official "Logan" Blu-Ray DVD Extras Have Been Added! As you requested earlier we have the extras from the DVD that has been released from Fox DVD Espana channel so check it out in the gallery and enjoy the previews below. Stunning visuals and of course Hugh is looking so much better than usual! 20th Century Fox has released the first The Greatest Showman images. The original musical is based on the life of P.T. Barnum and follows him from his poverty-stricken childhood to the launch of his first circus in New York. Hugh Jackman stars as Barnum alongside Zac Efron, who plays Barnum’s business partner. That character in turn falls in love with a trapeze artist played by Zendaya. Michelle Williams co-stars as Barnum’s wife Charity. Hugh Jackman puts "together a show" of unique individuals in the first trailer for Fox's upcoming musical, The Greatest Showman. In the film, Jackman plays P.T. Barnum, who goes from down-and-out and unemployed to inspired to create a circus spectacle, which becomes the famous traveling Ringling Bros. and Barnum & Bailey Circus. New Appearance: Exclusive Hugh Jackman Attends The "Logan - Noir" Premiere! Hugh Jackman and Dafne Keen surprise fans at the London premiere of 'Logan Noir' on June 15, 2017. Hugh looks just as stunning in his usual classy suits and looking hot as hell in his brand new haircut and clean cut look. New Appearance: Exclusive Hugh Jackman Attends 1926 Montblanc Heritage Launch Event! Lottie Moss attends '1926 Montblanc Heritage Launch event' on June 14, 2017 in Florence, Italy. Hugh Jackman proudly flaunted his expensive accessory as he posed on the red carpet at the 1926 Montblanc Heritage Launch event in Florence on Wednesday. The Wolverine star, 48, looked typically suave as he posed in a navy two-piece suit and matching tie. New Appearance: Hugh Jackman And Wife Attend The Sephen Weiss 2017 Apple Awards Last Week Added! Deborra-Lee Furness, and Hugh Jackman attend the 2017 Urban Zen Stephan Weiss Apple Awards at Stephan Weiss Studios in Manhattan on Wednesday, June 7, 2017. I have added more images from his appearance so check it out in the gallery! Head over to the previews below! New Appearance: Exclusiive Hugh Jackman Attends "National Night Of Laughter And Song" With His Wife Deborra! Hugh Jackman and Deborra-Lee Furness had a fun date night full of laughter! The couple stepped out at the National Night Of Laughter And Song event on Monday (June 5) at the John F. Kennedy Center for the Performing Arts in Washington, D.C.
Hugh and Deborra-Lee were also joined at the event by Kesha, Jerry Seinfeld, Jay Leno and Katie Couric. The special evening helped to benefit the David Lynch Foundation. The organization works to heal traumatic stress and transform the lives of at-risk populations, both youth and adult. Project Updates: Exclusive Hugh Jackman Shines In "Logan" Official stills + Promotional Images! Thanks for the amazing support we have been getting all this while and now we have added stunning images from "Logan" for you to enjoy! Check out more in the gallery and enjoy! New Appearance: Exclusive Brand New Hugh Jackman Attends Tokyo "Logan" Screening! Thank you for still sticking around with us as we are striving to bring you the best on Hugh's latest news, scoop and medias! Stay tuned as we just added 70+ high quality images from the latest event which he attended in Japan and he was supporting the premiere of "Logan" there with his director. So check out the gallery to view the rest and enjoy the previews below! Gallery Updates: Exclusive Hugh Jackman Portraits During Berlin Photo Calls Back In 2015! Thank you for the amazing support we have been getting all this while so we would like to extend our gratitude to Jackman's Landing for these amazing set of images from her previous photo calls that he had done in Berlin for his film in year 2015! Catch the gallery to view the rest of the images and enjoy the previews below!